Sony's predecessor to the VPL-VW295ES reviewed here was a groundbreaking product. The VPL-VW285ES, introduced in fall of 2017 at $4,999, was heralded as the first true native 4K projector costing less than $5,000—"4K under $5K" was the bold marketing cry. The VPL-VW295ES replaced the VW285 at the same $4,999 price late last year and continues to hold the industry title of least-expensive native 4K projector—this, despite arch-rival and fellow LCoS proponent JVC finally releasing native 4K consumer models of its own this year. It's joined in the company's current line-up by the VPL-VW695ES ($9,999); VPL-VW885ES ($24,999); VPL-VW995ES ($34,999); and the pro-grade VPL-VW5000ES ($60,000). The 885ES and 995ES have laser light engines; the others have lamps. While $5,000 isn't exactly pocket change for most folks, by definition the VW295 "entry-level" Sony must sacrifice some features and performance over its pricier brethren. So it does, though it can hardly be called stripped down. To begin, it's built on a solid 31-pound chassis and features the same 14-element motorized lens used in the 695ES and 885ES step-up models (all glass, Sony says, except for the aspherical front element—a design choice said to make the projectors lighter and less expensive with virtually no impact on image quality). The VW295 offers up both HDR10 and HLG HDR compatibility with a wide color space spec'd at 127% Rec.709, which equates to 100% DCI-P3. Sony's excellent 4K/2K Reality Creation scaling and detail processing is on board, driven by the company's late-generation 4K processor. There's Motionflow frame interpolation for both 1080p and 4K signals, two 18 Gbps full-bandwidth HDMI ports that play back 4K/60p HDR signals, and an input lag reduction mode for gaming as well. So, what's missing? Most obvious are the lack of lens memory settings and, more critically for image quality in this lamp-based model, a dynamic iris. The projector is also spec'd at a somewhat modest 1,500 lumens light output, a bit low by today's standards for this price class. Taking these one by one, lens memories are helpful for those with a 2.35:1 aspect ratio 'Scope-style screen who want to retain a constant image height (CIH) display with 16:9 content without the use of an expensive anamorphic lens attachment and sled. Its omission will deter some users, but probably not many, and the VW295 does have anamorphic picture modes to match a 1.24x or 1.32x lens if needed. The omission of a dynamic or even manual iris to help shut down light from the lamp would noticeably compromise the ultimate black floor and contrast on dark scenes compared with same-generation Sony models offering this feature (or a control for modulating the laser in those models). It's reasonable that Sony would hold this for its premium projectors, though disappointing not to have it in a $4,999 projector. This absence is somewhat mitigated by inclusion of Sony's latest SXRD LCoS imagers—the same device used in the VW285, which benefits from improvements to the reflective layer at the back of the chip that help to deepen blacks. Sony has also made adjustments to its HDR tone-mapping this year versus the VW285 to preserve more detail in dark areas. I'll have more to say later about the 295ES's blacks and contrast. The 1,500 lumen brightness rating stands out at a time when many projectors are up in the 2,000 and above lumen range, which becomes more critical for ambient light viewing or with very large screens where you might bump up against the VW285's limits. Sony's other models range from 1,800 lumens up to 2,200 in the VW995ES before jumping to 5,000 lumens in the VW5000ES. I should note that our sample also fell a bit short of its spec in our ANSI lumen measurements. Still, with average-sized screens (say, up to 120 inches) it should offer up good brightness for a dark room theater or moderate ambient light viewing. More to come on that as well. What are your thoughts on the need to upgrade from the prior model from last year (285)? David, as I mentioned, I didn't have a VW285 to directly compare it with, but Sony did confirm for me that the VW295 uses the same SXRD imaging chips (i.e., you are starting with same native blacks) and that the only apparent differences one might see is in the HDR tone-mapping, where Sony has done some tuning to better retain shadow detail. Otherwise, there is essentially no significant change to the feature list. I doubt the differences here would warrant an upgrade to the newer model if you're already watching a VW285, and may actually be difficult to see on screen with any regularity. Great stuff!! Is there a JVC RS540/790 review forthcoming and/or shootout with the VW295ES? 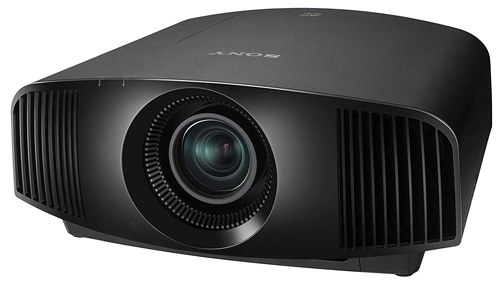 1) Noticeably deeper blacks on the JVC (not surprising given that the DLA-X790, now $3,999, was the mid-line $7,999 projector in their line up until this year, with both a high specified native contrast ratio and an effective dynamic iris (which the Sony lacks). The difference was very apparent on the most challenging dark material, but not really a factor in most mixed light/dark content. 2) About equal on most UHD scenes in terms of apparent detail, though the Sony could look sharper with 1080p content. 3) The JVC has a lot more tweaks for HDR content that allows you to better tune the image, though I was generally very impressed with the Sony's HDR. Hi Rob...I appreciate your review. Very informative. I noticed that you had a light output of 34 FtL for your SDR viewing. Was that not eye fatiguing for you to watch? It is for my wife and I. Just curious if you had the lights up a bit and have light colored walls to compensate, which is what we usually do. Or did you have some other way to mitigate the light output in SDR? We currently use 4k TVs, but plan to get a projection setup for a new light-controlled media room. We want to watch HDR movies in scope, but using a constant image height approach results in light output for SDR in 16:9 in the upper 20's FtL to mid-30's, which is where you landed with the -295. Appreciate your thoughts/comments. Thanks. Thanks, Ralph. I anticipated getting some questions about the peak white I was reading with my spectrometer and actually watching because it did seem high to me and I initially questioned the reading, but I have no reason to doubt the veracity of my equipment or my CalMan software. I made sure I mentioned in the review that I have a 1.3 gain screen and measured on a 15% centered white window, which will result in a brighter reading than you'd get with a 1.0 unity gain screen or from other locations on the 1.3 screen due to the inherent and unavoidable hot-spotting with a higher gain screen. This is nothing easily detectable by eye on a high quality Stewart Studiotek 130, but by definition there's a measurable hotspot. This may help explain why watching images on the full screen was more comfortable to my eye in a dark room than the number suggests it should be, though I do like a bright image generally. I did occasionally dial down the Contrast (HDR) control with some HDR content that was clearly too bright, specifically discs that were obviously encoded at a very high average picture level (the movie Pan was one of them). But I don't actually recall having to drop the regular Contrast control with SDR content, and the peak white reading off the screen that I mentioned was after adjusting Contrast to where it retained detail just beyond video level 235 on my generator test pattern. So I wasn't blowing out the highlights or pushing the image extensively despite that reading. Perhaps the message here is that I need to swap out my 1.3 for a 1.0 to better insure the universality of my measurements for review purposes. Thanks, friend. I did notice some changes to the speed of the HDMI interface between both models. Thoughts on relevance? Dave. David, I wasn't aware that they had updated the HDMI ports from the VW285, but what I can say is that the two ports on the VW295 are HDMI 2.0b and both equipped with HDCP 2.2, which means 18 Gbps for each along with copyright management to clear any currently protected source signals/components. This should allow playback of UHD content (2160p) at 60 Hz with HDR, something I confirmed with my Murideo Six-G generator and with playback of the only 2160p/60 UHD Blu-ray I'm aware of, Billy Lynn's Long Halftime Walk.